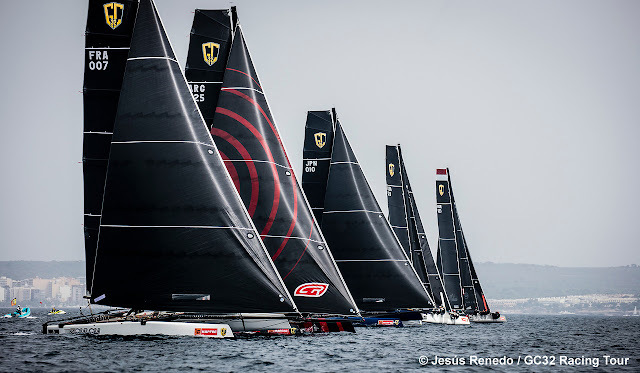 All great images as usua by Jesús Renedo / GC32 Racing Tour. I followed gps tracking today. So good to see my friends leading and getting a great 5th overall in the first race. After receiving and sailing the boat directly at Garda and Copa del Rey being their 2nd event , they should be proud for an owners boat to get ahead some experienced and other full pro teams in such short time. Another known Arg catsailor many know from the A-Cat, Sergio Mehl, had a ride yesterday on Engie invited by Aontoine Joubert. 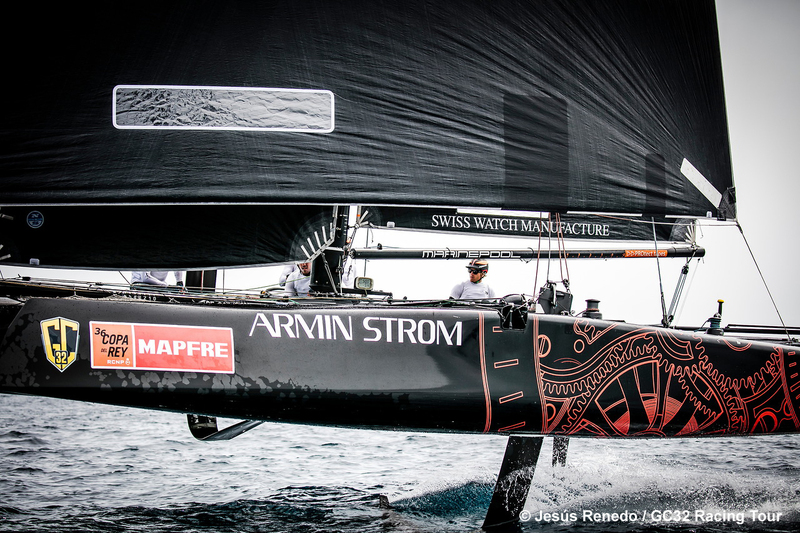 He re confirmed all the feedback we have and the assessments we did on the GC32: Super stable, safe and a joy to sail. Official web & Live GPS Tracking www.gc32racingtour.com . For conditions and local report below report sent by GC32 Racing Tour Press. Highly variable, tricky conditions made for a tough day for race officials and crews alike as competition at the GC32 Racing Tour got underway at 36 Copa del Rey MAPFRE. 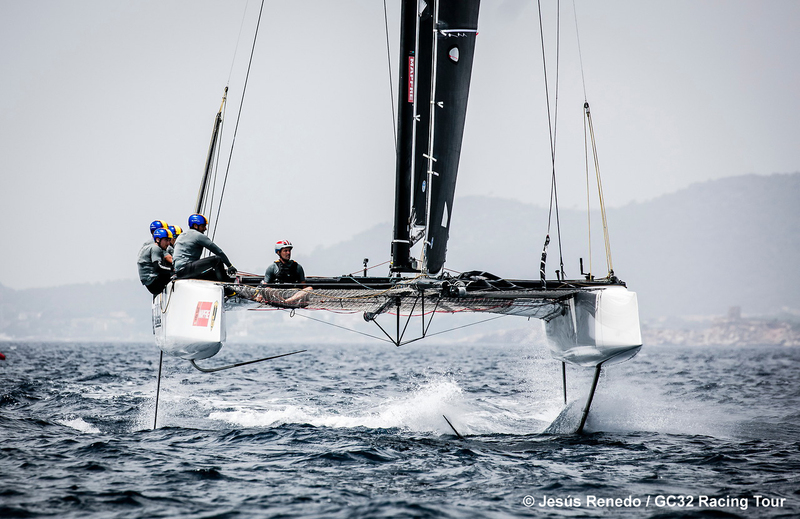 usual this involved the GC32s individually sending it towards the reaching mark before gybing and reaching back. In both rounds of the 0.72 mile course it was France’s Erik Maris and his crew on Zoulou that put in the best performance, their 21.78 knot average in the second round proving the best of the day. “We felt we did pretty well,” said Maris with a grin. “Going fast in a straight line is something I know how to do – it reminds me of my motor racing!” Maris has a long history in motor sport and this year competed at the 24 Hours of Le Mans. Otherwise Maris didn’t feel he had been starting particularly well today. “We left ourselves with plenty of work to do for the rest of the races, but it was fun – we enjoyed it.” Maris is competing for the rest of the 2017 GC32 Racing Tour with a crew including French America’s Cup legend Thierry Fouchier and others from Groupama Team France. Thoughout the day conditions were highly variable, shifting around 180-240°, building to 12-14 knots only to drop down to 5-6 knots before building again. It was tough for the crews and race officials, who had to move the course on three occasions before racing could get underway. Thanks to this, only two races were held before the wind disappeared for the afternoon. Making most sense of this was Jêrome Clerc and his crew of Swiss lake racers on Realteam who nominally lead at the end of day one thanks to winning today’s second race. 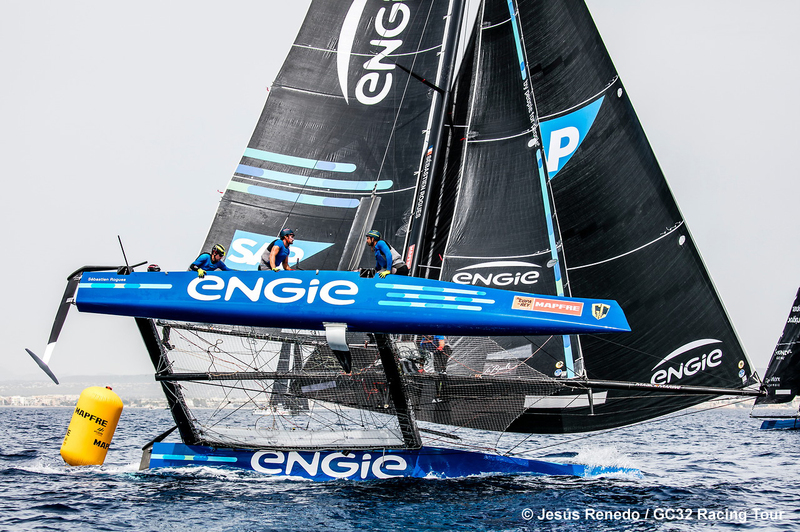 However they hold the same points as the Sébastien Rogues-skippered Team ENGIE and Naofumi Kamei ‘s Mamma Aiuto! from Japan, skippered by local Majorcan sailor Manu Weiller. 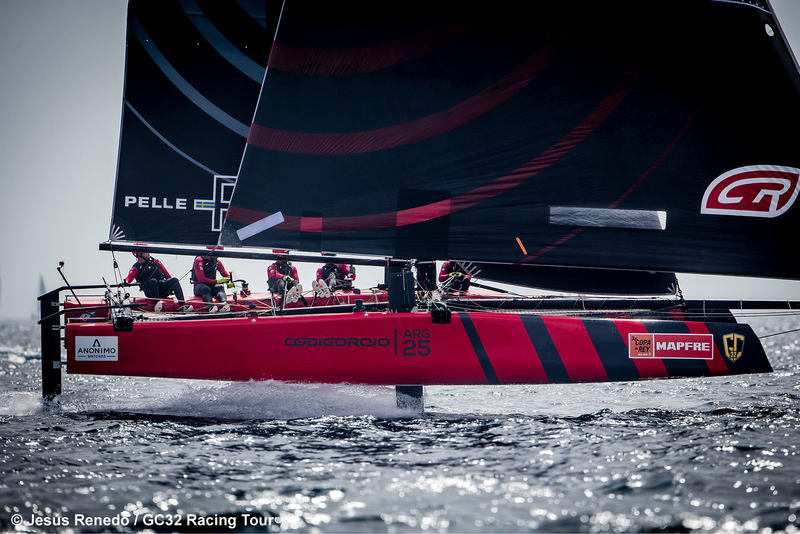 “We managed to avoid a bad result, but the wind made it very hard,” explained Clerc. “The first race was very tricky – like on a lake! The last race was great – a foiling race.” In this Pierre Casiraghi’s Malizia – Yacht Club de Monaco led for the first lap, before the Swiss team overhauled them on the second upwind. “They were far right, while we were mid-left with better pressure and good speed,” said Clerc. 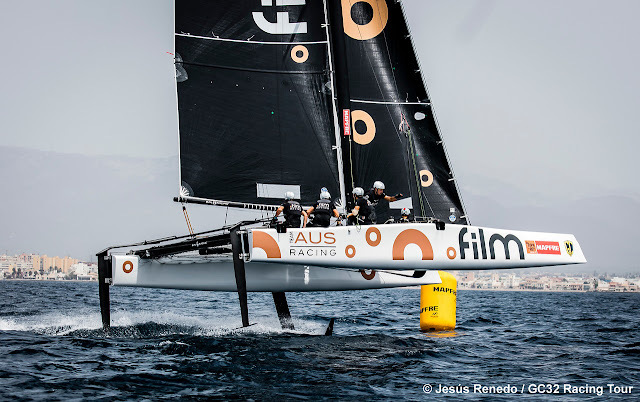 The wind picked up for the end of the second race when Jason Carroll’s Argo, winner of the GC32 Villasimius Cup, and Zoulou screamed across the finish line on foils, overlapped. Delighted by his first ever day on the GC32 Racing Tour was Australian Simon Delzoppo and his crew on .film Racing. 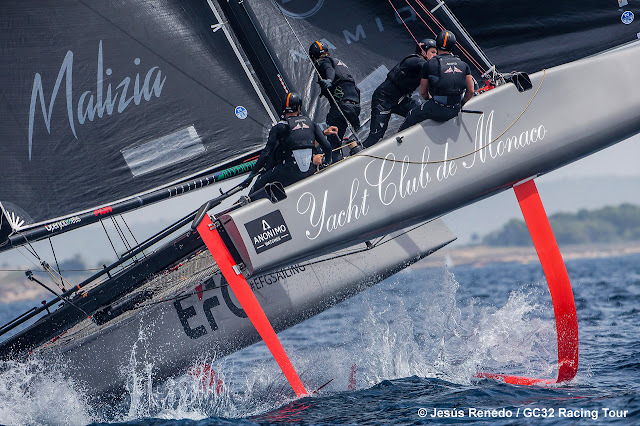 After finish second today in the ANONIMO Speed Challenge, 0.71 knots slower than Zoulou, Delzoppo sailed his first ever GC32 race… and won it by a large margin. Sadly they were unable to repeat this performance in race two when they were boxed in and ended up with a second tier start on port. They then suffered an issue with the Cunningham on their brand new boat, causing them to drop off the pace. Racing continues tomorrow with a first start scheduled for 1300 CET.